Teachers are an indispensable part of the debate on the development of critical thinking skills. Much research has centered on examining teachers' critical thinking skills, and on empowering teachers for more effective delivery of critical thinking in instruction (Perkins, 2014; Gardener, 2011; Duron et al, 2006; Abrami et al, 2008, Choy & Cheah, 2009). This chapter examines one of the key forces impacting the global context for critical thinking, teachers and teacher education today: an international mandate for critical thinking as a vital 21st century skill for the effective preparation of citizens and workers for life and work in today's society. The chapter begins with an exploration of the meaning and conceptualization of critical thinking. It then deliberates on how the international mandate for schools and teachers engenders a context for critical thinking in teacher education and considers the need for increased pedagogical support for educators. As a final point, the chapter points to some implications for classroom practitioners and teacher educators of delivering on the demands for critical and reflective workers in 21st century society. Education would be much more effective if its purpose was to ensure that by the time they leave school every boy and girl should know how much they do not know, and be imbued with a lifelong desire to know it. William Haley, British Editor. 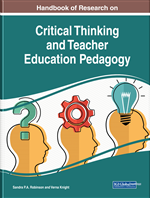 What is the current situation in which teachers find themselves which necessitates that the teaching of critical thinking be a significant part of teacher education and teachers’ professional development agenda? Why has critical thinking become so important as an educational goal? Why must teachers and teacher educators be concerned about the state of critical thinking in classrooms today? These are a few of the many questions which can only be answered by delving into an interrogation of the educational context and inherent factors informing the conceptualization and delivery of critical thinking as a skill required of teachers, and teacher education institutions today. Consequently, the complexity of the decisions teachers face require different kinds of knowledge and judgement that they will bring to the contexts in which they work. To meet the education expectations of these 21st century contexts, teachers must be aware of the many situations in which students’ learning and thinking can unfold. Making these judgements requires a type of instructional leadership that keeps what is best for the learner at the centre of the decision-making process. Teaching for thinking is central to education. And, critical thinking has long been an important skill for those who learn and those who teach. This ability to draw together knowledge from many different disciplines enables one to make good judgments about what to believe or what to do; it is an essential characteristic of critical thinking skills. However, translating critical thinking into tangible teaching goals continues to be a pedagogical challenge in teacher education classrooms. The result is a discrepancy between what is valued and what is pursued (Tsui, 2001). In order to ensure teachers’ facility to apply critical thinking skills to tasks and the ultimate role of teaching, it is necessary that their education and development provide them not only with practical ways to improve their abilities in this area of scholarship but also to explore and understand how the students they will teach perceive, conceptualize and value critical thinking. This chapter examines one of the key forces impacting the global context for critical thinking, teachers and teacher education today: an international mandate for critical thinking as a vital 21st century skill for the effective preparation of citizens and workers for life and work in today’s society. This mandate has resulted in increasing demands on teacher training institutions to produce critical and reflective teaching practitioners; and has motivated increased teacher ownership of their own professional development and subsequent efforts to access a deeper understanding and skillful application of critical thinking in their classrooms and across disciplines. The chapter begins with a discussion of the meaning and conceptualization of critical thinking. It then moves on to examine the international mandate for schools and teachers, and ends with a discussion of the need for providing increased support to educators in the quest to empower classroom practitioners and teacher educators to best deliver on the demands for critical and reflective workers in 21st century society. In the last two decades, increasing emphasis on the importance of teaching critical thinking skills and findings from research into critical thinking as an essential component of academic and instructional engagement have triggered changes in strategies and activities which inform instructional practice (Brookfield, 2011; Tang 2009, Paul and Elder, 2006; Erickson; 2007; Browne and Freeman 2000). These changes have collectively provoked a shift towards greater efficacy in instructional techniques and procedures which both engender critical thinking skills and effect a “level of intellectual sophistication required for higher education” such as teacher education (Lauer, 2005; Tremblay and Downey 2004; Guest 2000). As a consequence, as student teachers in training, teachers are deemed to be critical thinkers if they are able to analyze, synthesize and evaluate concepts (Guest, 2000, Gokhale, 1995). In fact, “[for teacher educators], developing and shaping [teachers’] critical thinking skills is an important goal” (Chenault and Dulcos-Orsello, 2008; Vesely & Sherlock, 2005, Siegal (1988) cited in Tsui (2001). Cultural Forces: Influences or energies present in every group learning situation which act as shapers of the group’s cultural dynamic. Eight cultural forces are identified as: language, time, environment, opportunities, routines, modeling, interactions, and expectations. Stages of Critical Thinking: A pretest-posttest design is a kind of experiment in which a group is tested/studied before and after the particular experiment or activity is administered. In this way it is possible to determine what changes if any have taken place and thereby judge the effect or value of the experiment. Thinking Disposition: Being habitually inquisitive, well-informed, trustful of reason, open-minded, flexible, fair-minded, cognizant of personal biases, prudent in making judgments, willing to reconsider, clear about issues, orderly in complex matters, diligent in seeking relevant information, reasonable in the selection of criteria, focused in inquiry, and persistent in seeking results (APA, 1990; Ennis, 2011). The most common thought patterns, or “thinking dispositions,” are based on characteristics like motivation, attitude and emotion. Critical Thinking Skills: The skills that needed in order to be able to think critically are varied and include observation, analysis, interpretation, reflection, evaluation, inference, explanation, problem solving, and decision making. Classroom Instruction: “The purposeful direction of the learning process”; one of the major teacher class activities (along with planning and management). Critical Thinkers: Critical thinkers possess cognitive skills such as interpretation, analysis, evaluation, inference, explanation and self-regulation (Facione, Facione, & Giancarlo, 2000; Dilley, Kaufman, Kennedy, and Plucker, 2015; Riddell, 2007). Cultures of Thinking: Places/spaces where an individual (or group’s) thinking is valued, visible, and actively promoted as part of the regular, day-to-day experience. Reflective Thinking: Part of the critical thinking process; refers specifically to the processes of analyzing and making judgments about what has happened. Hierarchical Taxonomy: Classification of behaviors into cognitive reasoning and thinking skills. Differentiates clearly between lower and higher order thinking skills. Pedagogical Tools: Pedagogical tools are designed to convey important lessons and allow people to improve their understanding of a problem or undertaking. Resources used to enhance, support and facilitate the teaching/learning situation.